Here’s a game that knows the surest path to my affections: have a craptacular pun in your title. 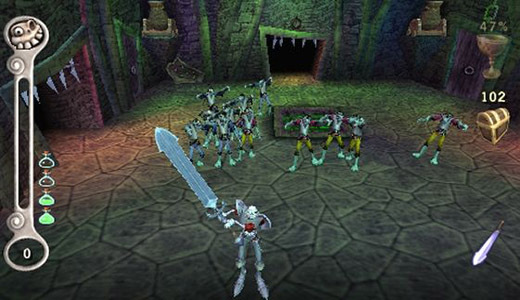 Cult classic MediEvil was released for the PlayStation in 1998. It’s an oddly gothic action-adventure from what is now Killzone’s Guerrilla Studios, and is often regarded as among the console’s best. Grab your sword, shield and… bizarre magical chicken leg, and we’ll take a look. 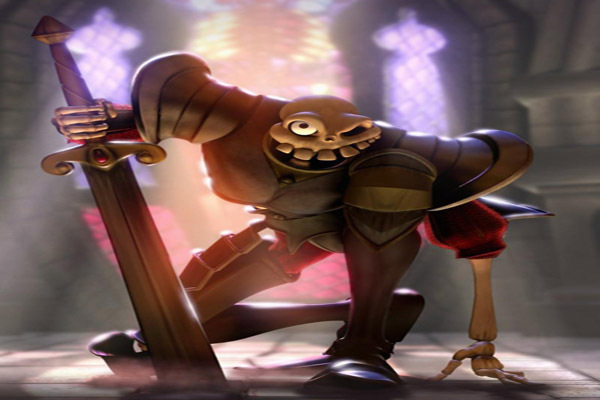 The star of the show is one Sir Daniel Fortesque, an allegedly heroic knight and commander of the forces of Gallowmere. He was killed in battle against the army of nefarious Sorcerer –and terrible-robe-wearer– Zarok. He earned his place in legend for this, and a rather fancy tomb, but it’s all FILTHY FILTHY LIES. In truth, Fortesque was a coward, and met his demise by a stray arrow while running from the battlefield. But you know how it is. ‘Frankly, he sucked’ doesn’t look as good on a tombstone. Anywho, it’s all moot. Upon Zarok’s return, the wicked wizard resurrected the dead of Gallowmere, to swell the ranks of his dark army once more. This also brought Sir Daniel back, and he returned desperate to atone for his suckiness and earn that reputation of his. He wipes the dust and cobwebs from his armor, puts his rusty codpiece back on, removes a stray maggot or two from his skull, and sets out to vanquish Zarok for good. We’ve all had this dream. Y’know, the one where you’re a blurry skeletal knight from the 90s, and a pack of equally blurry zombies were shuffling forward to chew on your eye socket? The journey takes him from the graveyard to the sorcerer’s fortress, with a spangly ghost ship and creeptacular haunted village thrown in along the way. There are some fantastic boss battles, the Stain Glass Demon and… a forty-foot pumpkin among them. You’ll bash a big ol’ dragon in the head with a hammer, a la Ocarina of Time’s Volvagia. You’ll be shrunk to Borrower size and explore an ant’s nest. You’ll throw that magic chicken leg at zombies to convert them into health-restoring roast chicken. What’s not to like? As macabre as the story and setting may be, there’s a black humour and a twisted charm about the whole thing. This isn’t a ‘horror’ game by any stretch. It’s more of a The Nightmare Before Christmas sort of affair. If Tim Burton made a video game (which I’ve long thought he damn well should), it would look a whole lot like MediEvil.